Stuck with the kids or grandkids in a doctor's waiting room or an airport? Looking for an easy way to entertain them? If you have a deck of cards and the kids are old enough to recognize numbers, you have it made. There's no need to have special cards to play lots of old-fashioned favorites, as well as others that may be new to you. While you're at it, teach them basic card playing etiquette, too. 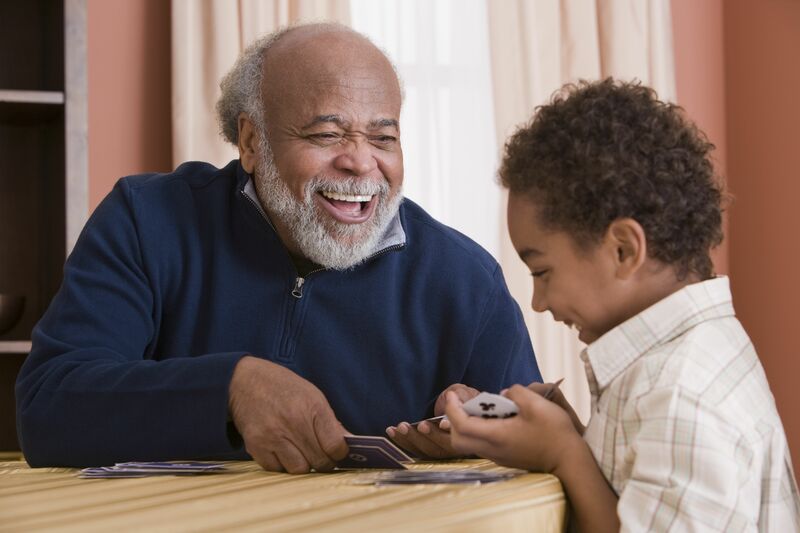 This is a two-person game, perfect for a grandparent and grandchild because it requires some thinking but not a lot of sophisticated strategies. Each player is dealt ten cards face down in two rows of five, with the remainder of the deck face down between the two players. The youngest player goes first, taking a card from the deck. If it is any card from ace to 10, it is used face-up to replace the face-down card in the corresponding position. The player then looks at the replaced card and places it in the corresponding spot, if possible. Kings are wild and can be played in any spot. The player's turn ends when a card is picked up that has no place to go or when a jack or queen is drawn. At that point, the player discards the card in his or her hand in the "trash." The next player can "dig in the trash" (pick up the discarded card) or draw. Play continues until one player has replaced all face-down cards with face-up cards. That is the end of round one. For round two, the winning player uses only nine cards. The winning player also goes first. The game ends when a player gets down to one card and wins that round. Spoons is a raucous game, great for grandma camp and family reunions. At least three players are needed to play, and more players means more fun. Players sit in a circle on the floor or around a table. Spoons are placed in the middle, one fewer spoon than players. Each player, including the dealer, gets four cards. The dealer takes one card from the deck. If it improves his hand, he adds it, discarding another card, which he slides to the player on his left. If not, he passes the card on. The player on his left does the same until all players are passing cards. The first player to collect four of a kind quietly takes a spoon. When the others see the spoon taken, they grab for a spoon. One player will be left without a spoon and is eliminated from play. Play continues until one player is left. You can buy a Memory game in many versions, but why bother when you can play with regular cards? Two to six players can play. Lay the cards face down in a 4 X 13 grid. Players take turns turning over two cards, trying to match numbers. If a player makes a match, he or she picks up the cards and goes again. If the numbers do not match, they are turned back over. The point of the game is to remember each card that is exposed that is not a match. Play continues until all the cards have been matched. The player with the most cards wins. Go Fish is the first game most kids learn to play, and it's great for preschoolers. From two to five people can play. Seven cards are dealt to two or three players, and five cards to four or five players. The rest becomes the draw pile. The object is to obtain as many books of four as possible. The player to the dealer's left begins play by asking a specific player for all his cards of a certain rank. If the player addressed does not have the card, he says, "Go Fish," and the first player must draw. If the player gets his card, either from the other player or on the draw, he gets to ask again. When a player collects a book, he plays them down. A player who runs out of cards may draw one card unless the draw pile is depleted. When all cards have been played down, the player with the most books wins the game. Ties may occur. If the kids are bored with Go Fish, move up to Crazy Eights. Two to four can play. The object is to get rid of all of your cards. Two players receive seven cards. Three or four players receive five cards. The rest of the cards form the draw pile. Turn over one card to start the discard pile. The player to the dealer's left must match the card's number or suit. A player who does not have a match may play an eight and name the suit in play. A player who has neither a match nor an eight must draw until he gets one. The first to discard all cards wins. To play a longer game, add up the cards remaining in the losers' hands and give the points to the winner: 10 points for each face card, 50 points for each eight, and face value for the other number cards. Play to 200 or other designated number. This is my new favorite for playing with tween and teen grandchildren. It's fast-paced and exciting. It's easy to explain how to play if you know how to play Klondike solitaire, also known as Patience. Each player must have his or her own deck of cards with a distinctive back. Players set up their cards as in Klondike solitaire, except that only five stacks are created. Next, nine cards are put face-up in a separate stack, with only the top card visible. This is called the Pounce stack. Remaining cards are placed in a stockpile. When the game begins, each player begins playing his or her own game of solitaire. Aces are played in the middle of the table to create building piles that all players can play on. Cards from the Pounce stack can be played in either place, except for the last Pounce card, which must be played in the middle. When a player has no plays, he or she goes through the stockpile, looking only at each third card. When any pile in the solitaire set-up is played out, the empty spot can be filled with a king from the Pounce stack or the stockpile. Alternately, a stack with a king on the bottom can be moved to the empty spot so that the next face-down card in that spot can be turned over. When a player is able to play his or her last Pounce card, the player calls out "Pounce!" and all play ceases. The cards in the middle are split up and counted. Players receive a point for each card played in the middle minus two points for any remaining Pounce card. Play continues in this fashion until a player reaches 100 points. Kids love this game, which gives them permission to lie. Three to five can play. Each player is dealt an equal number of cards. The player to the dealer's left puts one or more cards face down in the middle, saying, "One ace" (or two, three or four aces). The next player must claim to be discarding kings, the next queens, etc. The catch is that a player cannot pass, so inevitably sometimes a player must lie. Any player can challenge another player's discard by saying, "I Doubt It." If the challenged player is discovered to be telling the truth, the challenger must pick up the entire discard pile. A challenged player who is discovered to be lying must pick up the entire discard pile. The first player to get rid of all cards wins. Stealing Bundles sounds cool, and it lives up to its promise. Two to four can play. Four cards are dealt, and four are placed face up in the middle. The first player either matches one of the cards in the middle, picking it up and placing both cards face up in front of him or adds another card face up in the middle. The next player has the same options plus another option: he can steal the previous player's stack, called a bundle, by matching the top card. Play continues around the table with each player either matching a middle card, playing a card in the middle, or stealing a bundle. When a player runs out of cards, the dealer gives him four more. If there are no more cards in the middle, the dealer replenishes them. When the dealer's stock is gone, the player with the most cards wins. Go Boom is a slightly more difficult game appropriate for tweens and up. Two to six can play. Deal each player seven cards. The remaining cards form a draw pile. The player to the dealer's left plays a card. The other players must match it in either suit or rank. A player who has no match must draw until he can play. The person playing the highest card in the suit led wins the trick and leads the next round. If the draw pile is exhausted, players who cannot play a card simply sit out the round. The first player to get rid of all cards wins. To play a longer game, add up the cards remaining in the losers' hands and give the points to the winner: 15 points for aces, 10 points for face cards, and face value for the other number cards. Play to 200 or other designated number. Snap is a game that rewards fast reactions. From two to 12 can play. Deal the whole deck of cards. Some players may have an extra card. Players' cards are placed in a stack face down. The player to the dealer's left turns over his first card, starting a face-up pile. The next player turns up a card. When two matching cards are turned up, the first player to call "Snap" gets both face-up stacks, placing them on the bottom of his face-down pile. If there is a tie, the stacks are combined and placed in the middle to form a Snap Pot. If a card is turned up that matches the top card on the Snap Pot, the first to call "Snap Pot" gets both stacks. The object is to win all the cards. Calling "Snap" when there is no match costs a player one card, given to the last player to reveal a card. Authors is a classic game. Chances are that Grandma or Grandpa played it when they were kids. From three to five can play. Deal the whole deck of cards. Some players may have one extra card. The object is to obtain as many four-of-a-kind sets as possible. The player to the dealer's left begins play by asking any player for a specific card, such as the four of hearts. The player must be holding at least one four to ask for a four. If the player gets the card he asks for, he gets to ask again. When a player collects four cards of a kind, he shows them to the other players and places them face down. When a player runs out of cards, he is out of the game. When all cards have been played down, the player with the most sets of four wins the game. Ties may occur. Beggar Your (or My) Neighbor sounds a bit difficult but is actually fun and fast to play. Two to four can play. The cards are dealt evenly face down in front of each player. Aces and face cards are known as court cards. If all the payment cards are ordinary cards, the first player adds the entire stack to the bottom of his pile. If a court card is turned over, the next player must pay the honor. One wins by ending up with all the cards, or by having the most cards when a time limit is reached. A classic game that can be played for a lifetime, Rummy exists in many versions and regional variations. These rules are for the classic version of the game. If you are playing with those who have played the game before you start, be sure that you are playing by the same rules. The object of the game is to play all of one's cards either in runs of the same suit or in groups of three or four of a kind. A turn consists of taking either the top card of the discard pile or the top card of the draw pile. If the player wishes to, he can play down one or more sets of cards before he discards. When a player is able to play down all of the cards in his hand, he "goes out," but he is not necessarily the winner of the hand. The winner is determining by counting the value of the cards played down and subtracting the value of the cards left in the hand if any. Good rummy players have to make a lot of strategic decisions, but children just learning the game can play on a simpler level and grow into the game. One problem with rummy is that it is difficult to adjust the game for younger players. You can always handicap the game by giving youngsters a set number of points before the game begins. For many children, the goal is to get good enough to beat Grandpa without the benefit of a handicap.